The "No Moose" Button is Back! Second to motorized vehicles, the moose is the most dangerous thing to a sled dog team and their musher. The "No Moose" button serves as 'insurance' of safe passage for a musher and their team. The "No Moose" button protected the teams in the 2000 Iditarod, and they are now back! My dear friend Lori created these buttons and is selling them for $6. The money from the sale of these buttons will go to helping me and my team to the Jr. Race to the Sky, Jr. John Beargrease, and Jr. Iditarod this winter! 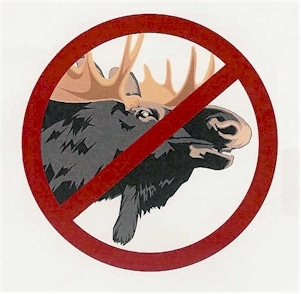 Please click HERE to purchase a "No Moose" button! Thanks to my friend Lori for doing this! Currently I am training a racing team of 12 dogs, with Alice and Bella as my main leaders, and Emmett, Jasper, Otter, Super Cub, Khufu, Newman, Ra, Tut, Kaycee, and Cessena. Although we are behind in training (because we had such a hot fall, and it is currently 45ºF today), the dogs are doing really great. We had to find a new training trail that we could use the ATV on, because are usual trail has too much gravel. Fortunately, the new trail is really awesome. Our old trail was very flat and straight, whereas this trail is very twisty and goes up and down with some real steep climbs. My dogs love hills and turns so they enjoy this trail much better than the 'boring' flat old trail. Even with all the steep hills to climb, the dogs are really fast this year. Also, something I am very excited about this year is that the team has a 12 mph trot, whereas in past years they were only able to trot at a max of 10 mph before having to break into a lope. With how well the dogs are doing with pulling the 500 pound ATV and me for 14 miles on steep hills, I am super excited to see how they will do with pulling the light sled on the snow! We are hoping to soon have enough snow on our snow training trails to start running with sleds, but this year we have A LOT less snow than we did this time last year. On another side note, CheVelle is learning to be a truck dog and coming on training runs with us. She will also come to races as long as she keeps behaving herself, which I'm sure she will continue to do.